Fortunately, Viral Solutions’ own attendees left San Diego on a high note, brains filled to the brim with all sorts of new and valuable information about the future of digital marketing. It’s important to keep in mind that there is more than just the Amazon Echo when it comes to devices enabled with voice search, though it’s certainly one of the most popular. Are YOU ready for a voice-first world? 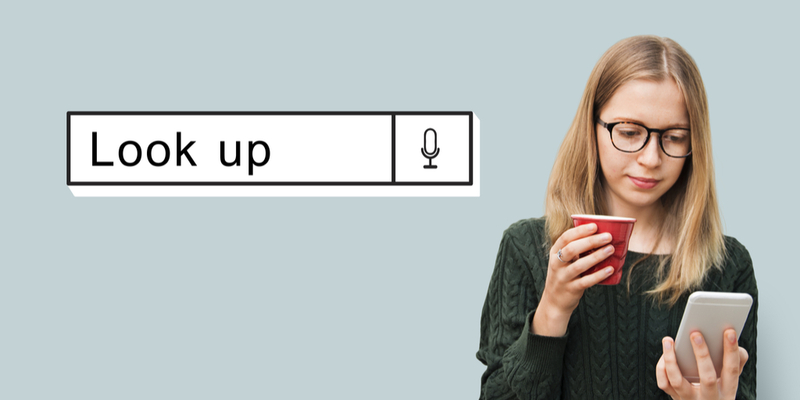 First things first—there are many factors to consider when optimizing for voice search. Take the keywords you are currently trying to rank for in a Google search and find out what comes up in position zero—also referred to as a featured snippet. Analyze the what, why, and how of the content and page that appear in position zero, and optimize your content to do better. When you win position zero, typically your result will be read to the user conducting the voice search or will show up as a voice search result. So, what are the pieces of position zero that you should be analyzing? Well, the title, description, and URL all should contain your keywords and, even more so, what is actually being asked in the voice search. Perhaps one of the most powerful things about winning position zero is that this spot is completely organic and not a paid placement. The articles that you are intending to rank for voice search should be using word and phrase strings that people say when they’re asking a real question. 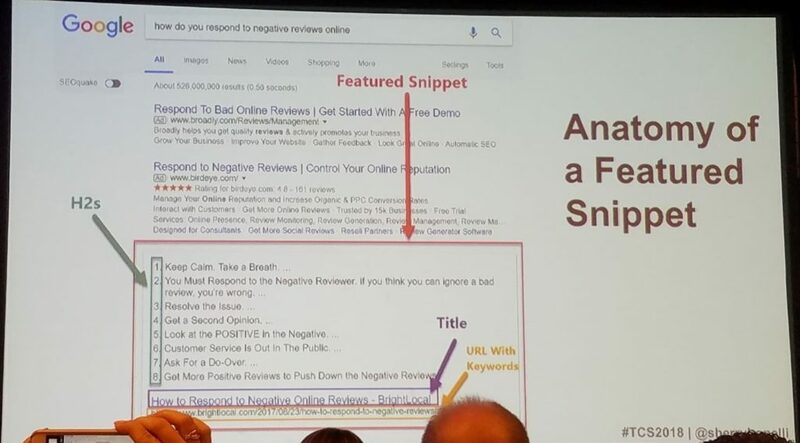 Tools such as answerthepublic.com can help figure out exactly what it is that people are asking as it relates to the keywords you are trying to rank for. At this time, the service is completely free! These articles and pages should be on individual and specific topics. Answers to questions should be at the top of your pages—ideally in the first paragraph. Find out what questions your customers/prospects are asking your sales team. Meet with your customer support team to discover the most frequently asked questions that they answer over the phone, email, or social media. Take these questions and create a list of answers on a page of your website. Heading tags are a huge factor when it comes to ranking for position zero. By using an H1 heading for your title and H2 throughout your content, Google can then crawl your site, combine your H2 headings, and make a simple how-to, step-by-step list. Simply bolding the text doesn’t work. You must make them H1 and H2 specifically. Rich snippets contain extra information about a website’s content on a search engine results page (SERP). These can show review stars, a featured snippet box, an answer box, etc. Rich cards are a new search result format building on the success of rich snippets. Similar to rich snippets, rich cards use schema.org-structured markup to display content in a more engaging and visual format, with a focus on providing a better mobile user experience. This is especially important if you are in a local market. Claiming your Google Business listing and being listed on online directories will help your local clientele find you when they are in need. Online directories include places such as Yellow Pages, Angie’s List, Yelp, Better Business Bureau, and Citysearch. Businesses targeting a local market should also keep in mind that the search engines that power voice search look at all of a site’s digital signals to determine voice search results. A searcher’s information and geo location are also taken into consideration. According to ComScore, 50% of all search will be voice search by 2020. With a projection like this and with voice search being in its infant stages, now is the time to be an early adopter. Competition for position zero and best rankings for voice search are only going to increase as time goes on. With voice search you either win or lose—there is no second place. 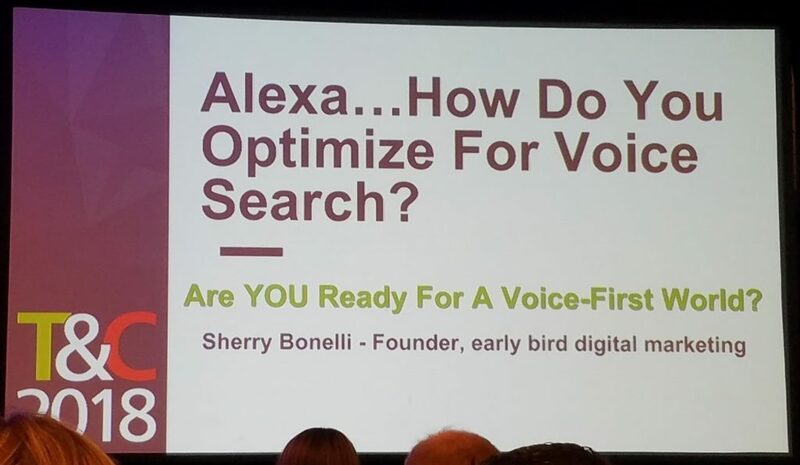 Though understanding how to optimize for voice search is important, don’t forget to check out the other great tips our team picked up on day one and day two of the 2018 Traffic & Conversion Summit.